Before I moved from Greenwood, IN to Charlotte, NC in 2012 I did not know if I should rent my house out or go ahead and sell it. The market at the time was not in the best shape and if I did sell my house I was going to take a hit. After meeting with several property management companies I came across Polaris. When I contacted Dan he came to my house in Greenwood the next evening. Dan was confident we could get the house rented quickly and that I would be an “armchair landlord”. I chose Polaris after doing quite a bit of research, checking references, and having all the documents reviewed by my Attorney. I left Greenwood for Charlotte in May of 2012 without the house being rented or having any idea of how this was going to turn out. I was nervous about having to pay two mortgages if the house was not rented quickly. True to his word, Dan and his team had the house rented within two weeks. The tenant stayed for the year lease and Polaris rented the house again with only a week between tenants. 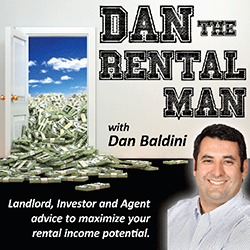 The second tenant signed a year lease and when the lease expired Dan and his team had a new tenant within seven days. In 2014 I decided to put the house up for sale since the market had come around and I felt confident I would be staying in Charlotte. Dan and his team sold the house for 97% of the asking price. My experience with Dan and his team was positive. They were responsive to my needs and the needs of the tenants. I truly was an “armchair landlord”. Yes, Polaris charged me maintenance fees but they were reasonable and they kept me from having to deal with tenants and maintenance issues. Besides, I was 600 miles away from the investment property. 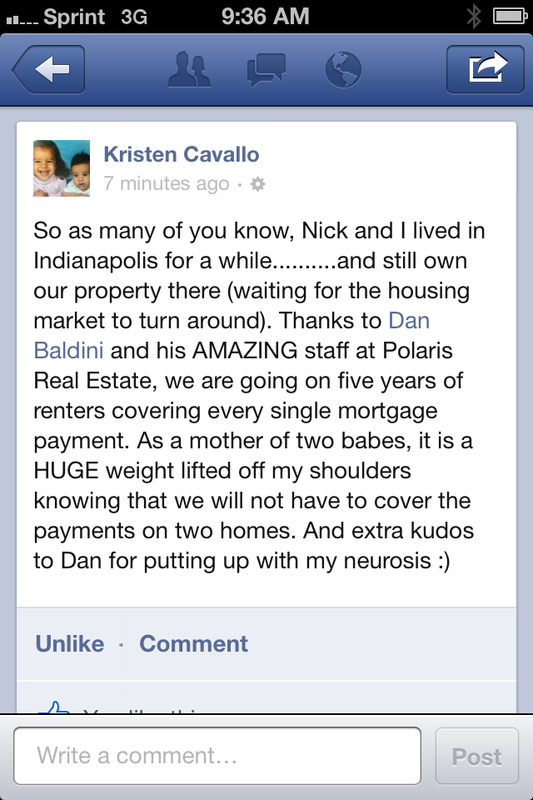 Friends have asked me if I would have used Polaris if I was living in Indianapolis and had the rental in Greenwood. My reply to them was yes. Yes, because Dan and his team have years of property management experience and they advised me on business decisions as I would have made emotional decisions. I would recommend the Polaris team to anyone thinking of or who already has an investment property. It wouldn’t have been awful news to hear the tenants weren’t re-signing, but it was a thumbs up from me. A few years ago when the housing market was bad, it was extremely uncomfortable to carry two mortgages. Plus it just felt wasteful. Using your company to rent turned lemons into lemonade, and even a decent vehicle to build equity in a house. Thanks. Ben was initially reluctant to work with someone recommended by a friend, but I stick to my story that if you aren’t working with your friends, aren’t you working with your enemies? “I’m basically comparing my experience in AZ with what was required of me as a homeowner in Indiana. I guess I expected it would be the same. [In Indiana] I had to have my house spotless and the carpets cleaned before the tenants moved in. Even though it is expected, it’s the right thing to do. If I don’t treat my place well, how can I expect the renters to do the same? I had to have three keys made for both the front door and mailbox. I didn’t just hand over my existing keys and say, “have at it…don’t lose them.” The property management team I worked with [Polaris] answered every single phone call and email without hesitation. I don’t think I even had to wait 24 hours to get a response. I get monthly statements about my renters and if either the tenants or I have an issue in Indianapolis, I can count on Polaris to take care of it quickly and professionally. I called and begged them to open up shop in Arizona so I could rent from them. This has been a huge mistake on my part, to assume that things would be the same as in Indiana. I expected the same amount of professionalism and integrity from my management in Arizona that I have in Indiana; obviously I was wrong. At this point I have no interest in renewing my lease out here in Arizona once my year is up. Polaris…Please, please, please open up shop out here. Teach these Arizona people how to run a professional company that cares about customer service! “Dear Dan: Thank you for your hard work and that of your Team at Polaris Real Estate in leasing my property on Rose Haven Drive- your Team filled it FASTER than I have ever filled it myself. In fact, you beat the shortest time it ever sat vacant by over 20 days! That’s serious money in my pocket! Your team handled the listing and the showings making it easy for me. There simply is nobody in Indianapolis who drives more leads to view my property online and then in person with showing appointments. And finally, there is nobody who completes the transaction with the end goal in acute focus- Maximizing Revenue while Minimizing Expenses. “Love your new website! Our house is taking shape. The outside is 95% finished and they should be painting the inside soon. So things are moving along.